The following is An excerpt from a paper on BIM for compliance of Handicapped Routing by Reinier Tinapay. Current CORENET E-Submission Guidelines lack the template, tools, families and parameters that assist in creating a more intelligent means of generating Accessibility-Compliant Models. As such, there is a tendency to revert to 2D methods to generate lines, paths and regions for routings. This 2d method is counter-productive. 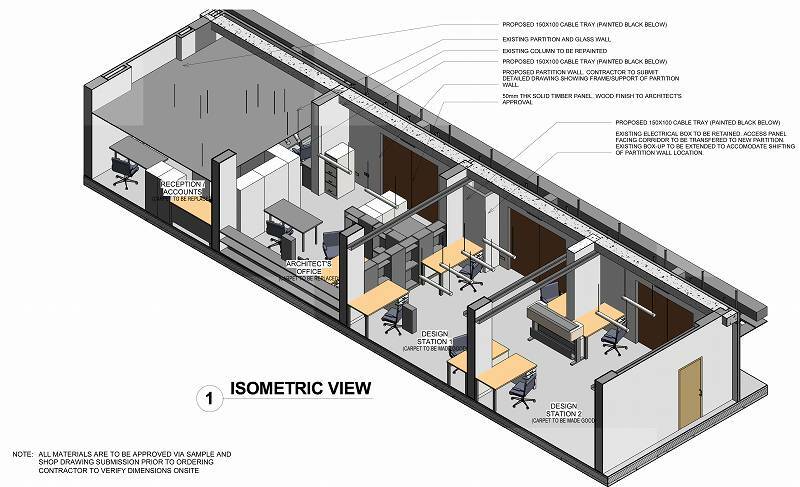 The Aim of this project is to explore, design and develop a compact BIM tool to improve productivity in utilizing BIM for modelling a BCA handicapped routing compliant model. 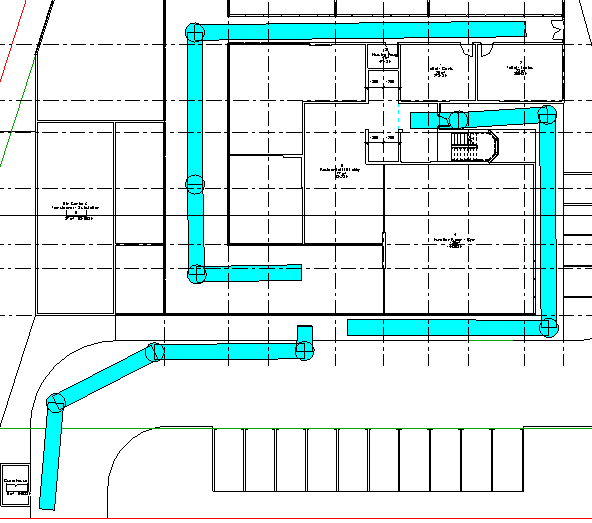 Using Autodesk Revit as the Authoring Software, the project maximizes pre-loaded tools such as schedules, conditional formatting and shared parameters to create a family that can be used as a checking and measuring tool for handicapped routing requirements. The result is a quick and reliable tool for measuring gradients, and routing clearances using a parametric 3d family. Due to its parametric customizability, it can also be used for measuring pipe run gradients, storm drain gradients and even staircase run-rise ratio. The study concludes that a parametric 3d family greatly improves efficiency. A significant amount of modeling time is saved when compared to annotating inside a view. This time-saving results in improved productivity. This study proposes standardizing the modelling procedure for BCA handicap routing using easy to adapt tools that can be used inside the 3d environment. 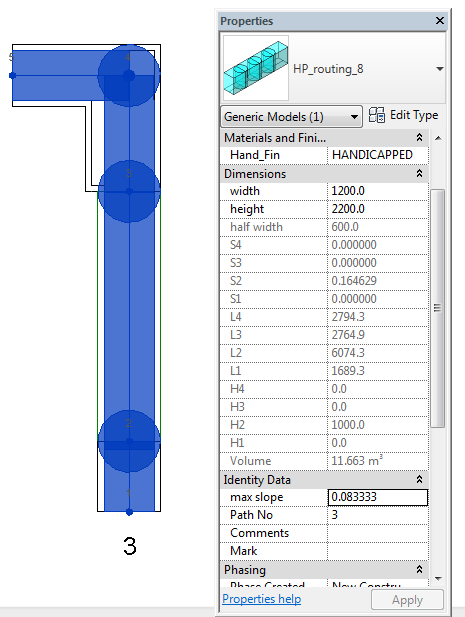 It attempts to harness in-built tools of Revit to create a parametric family capable of automatically detecting and high-lighting non-compliant ramp gradient (maximum 1:12) as well as creating a schedule of lengths and gradients. This family can be integrated into submission templates or prepared as an add-on pack. Using this adaptive component family, the study aims to create a routing plan for the project model to verify that it is compliant to authority requirements for Accessibility. 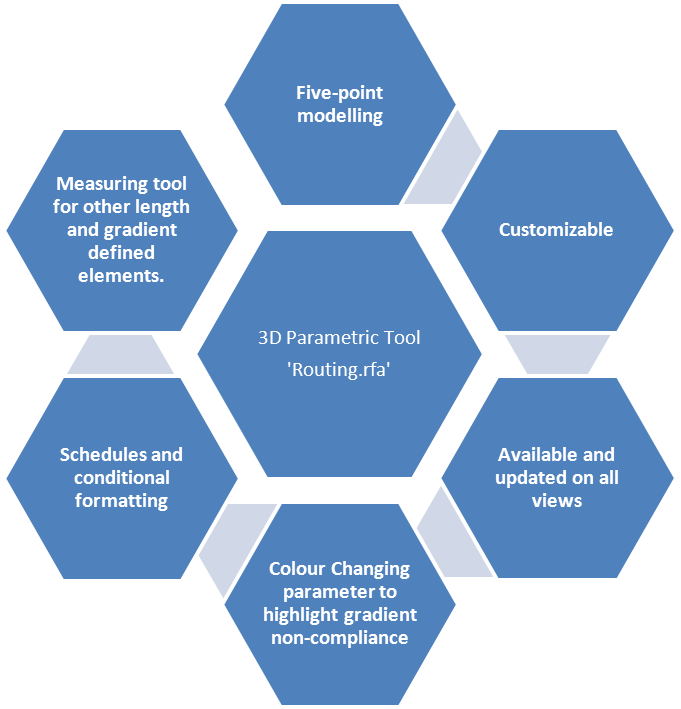 The ‘routing.rfa’ will be modelled as a 3d element therefore it can be examined on all views. It will highlight by colour coding compliant versus non-compliant segments of the route (figure 1 and 2). And ultimately, the information gathered from the family will be prepared in such a way that it can automatically be scheduled for preparation of a submission drawing. Additionally, this routing can also be used for interference checks (figure 3) to identify any non-compliance in headroom requirements. The Figure shows how the routing would show color coding when tested on different configurations of ramp gradients. The ‘routing.rfa’ underwent a series of design study and testing before a final parametric solution was deemed acceptable and useful. A handful of considerations were made regarding rotational issues of the 3d elements within the family mainly because Revit segments made using reference lines connected by adaptive points behave in such a way that they rotate non-perpendicular to the surface at certain angles. This resulted in a routing segment that constantly flipped depending on the angle. In the initial stages of trying to solve this issue, parameters were made to control angular tilt but these angular controls can only hold up to a certain degree as Revit tends to shift angle location from one side to another choosing mostly, but not always, to dimension the acute angles. Ultimately, the design issues were resolved by nesting families of segments within the family. This method allowed all elements of the family to remain upright as the nested segments can be set to always point upwards from a plane. The routing.rfa was designed to be flexible and customizable. It can be reconfigured to suit any clearance and gradient requirements. Height, width and node visibility can be configured at the properties panel. 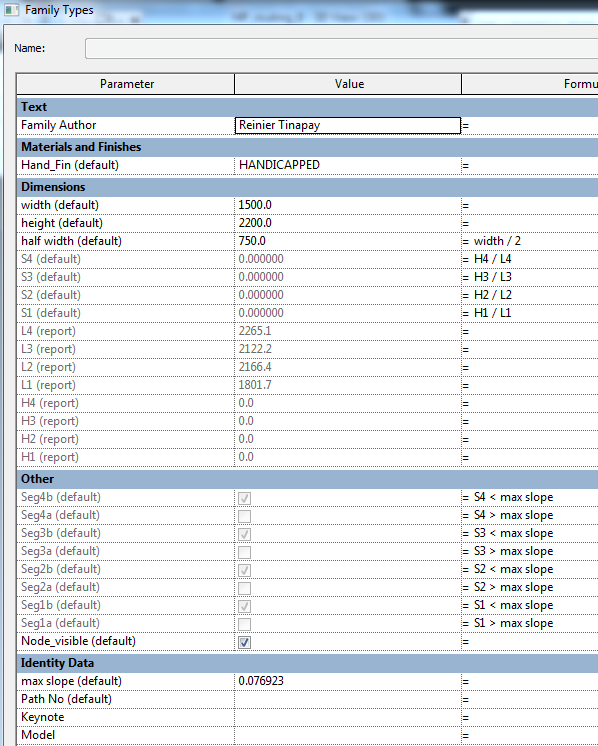 The numeric values of these attributes are shared parameters therefore it can be used in schedules. Its dimensional attributes can be modified to match various authority or presentation requirements. 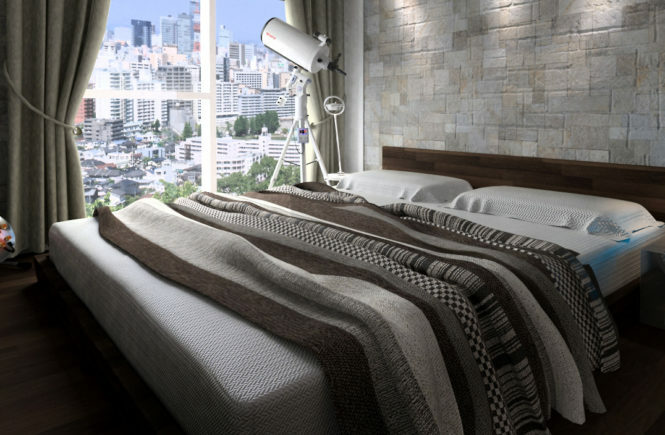 It can be 2.2 meters tall for head room clearance. It can also be thin and flat for presentation purposes. The component is a 3d solid with transparency set to allow it to be drawn on the model without blocking the objects behind it. This gives the modeller a better understanding of the ‘routing.rfa’s relationship to the elements around it. 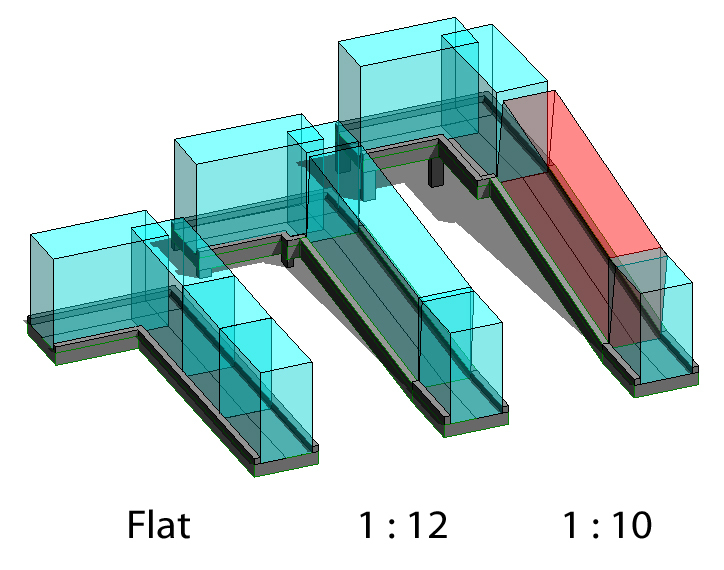 Likewise, since it is a 3d component, it can be drawn on plan or 3d view and will accordingly appear in all views. 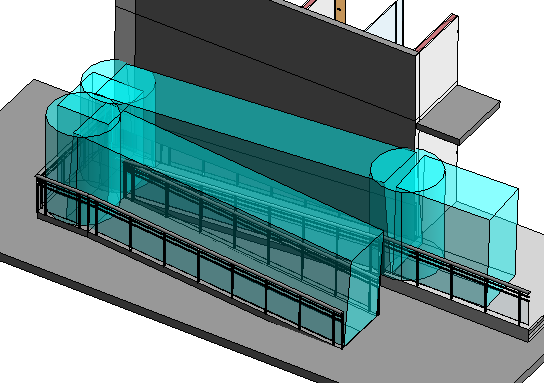 Compared to conventional means where the annotations are done on selected plan views, this method allows the user to examine the routing in a 3d context. This opens up a lot of possibility for analysis and design studies.